Belgium's King Philippe today laid wreath at the India Gate and paid his respects to the soldiers who laid down their lives during the First World War. 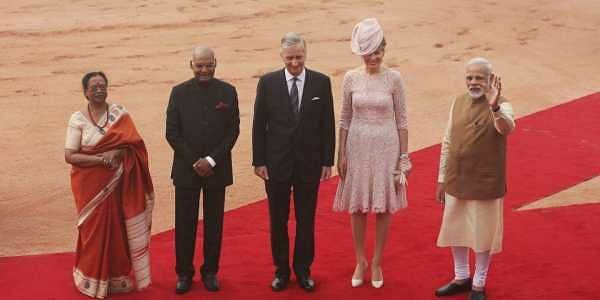 NEW DELHI: Belgium's King Philippe today laid wreath at the India Gate and paid his respects to the soldiers who laid down their lives during the First World War. Nearly one lakh Indian soldiers participated in the war -- some of whom were killed at Flanders Field while defending Belgium. Belgian buglers and twin brothers Rik and Dirk Vandekerckhove were specially flown to Delhi to play the bugle at the India Gate War Memorial during the wreath laying ceremony. Queen Mathilde and the king will launch a coffee table book "India in Flanders Fields" tomorrow to commemorate the role the Indian soldiers played in the First World War for Belgium.